When I got the OPI Nicki Minaj collection, I couldn't wait to try Fly - I think I put it on within an hour or so of opening the box. While I don't have pictures of Fly alone (you will have to wait a bit for the swatches, sorry - I am slightly behind again, but I plan on getting caught up soon! ), here is some fun flower nail art for you! This is really pretty! It makes me want to wear a bright color on my nails today! I love it! so springy and fresh! I love it! 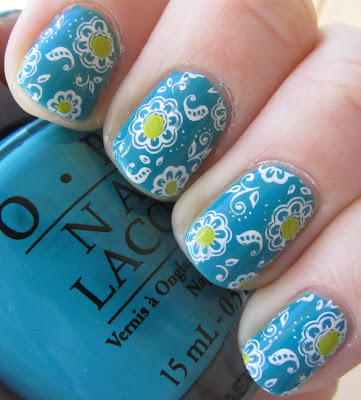 This is one of my favourite stamps but I'd never thought of adding colour to the flower centres. It looks great! These are awesome! I love that plate design! I need to use mine!